From the closing statement in section "a digression: on what the brain thinks about when it thinks about itself". "...the brain - and the mind to which it gives rise - is forever a work in progress. That's true not just for each of us as individuals. It's true for all of us as a species." So the mind springs from the brain? Man is therefore a machine of meat, regardless how much the author likes to protest this in places, this statement puts him in a box particularly scary when considering The Shallows thesis. However, it is particularly the closing sentence about us as a species that is ludicrous. One of his core theses is that the media impacts our brains and how we think, but to think that this impact is then passed along in a genetically mutated manner resulting in a change to the species is nonsense. However, if we go with his evolutionary world-view, why is he worried? Perhaps these changes would be good? Of course, in a purely mechanistic, chaotically deterministic universe how can he, or anyone, determine "good"? I guess if it is good, the species moves up the evolutionary ladder and if it is bad, is relegated to extinction and the apes can pick up where we left off. Sigh... evolution, the big lie of the perfectibility of man. Don't get me started on the nonsense phrase "intellectual ethic" thrown around along with "consciousness" throughout these first four chapters. If you share my world-view, then feel free to skip these chapters. Chapter 5 through the rest of the book is much more what I was anticipating and have much less to quibble with. It seems to me that his observations and the scientific research he cites build a compelling case that we should stop and think about this tool called the internet especially in regard to our children's use. The difference between reading a book vs. reading a web page full of even nothing other than some hyperlinks is a completely different experience. Studies from around the world show that hyperlinks alone create a distraction to the reader vs. those reading a plain page of text. The fears that this change in our consumption of information changes us from a "deep reading" society where reflection, meditation and rumination of ingested ideas have time to become true knowledge and possibly wisdom seem to me to be quite valid. I certainly believe knowledge and wisdom are "good" and valuable. If Augustine had been raised with an iPad in his hands and the internet from a small child, it is quite doubtful he'd have been the Augustine we know and we would all be the poorer for it. This book convinced me that if I had children I would not let them near an internet connected device till they well and fully developed into "deep readers". The chapter on memory and the effects of memorization definitely put me in remembrance (whoops, a pun) of all the Bible scriptures encouraging the memorization of scripture as being so important. God has told us everything we need to know including how to best build our minds. Of course, there are a lot of positive things about the internet, email, social media, etc. They are after all a tool that can be used for good or ill. Consider the study of the Bible. In one sense "The Shallows" makes the case that just reading it in plain text form (paper or on a dedicated such as a Kindle) would be best for "deep reading" impact. However, having the Bible in various translations and instantly searchable has proven valuable in my studies. "Deep reading" is one aspect I use for one avenue of study for knowledge and wisdom. Another aspect is using online and other electronic functionality to efficiently cross-reference topics and word studies. I suspect Augustine, Calvin or your favorite theologian or philosopher of the past could have made good use of an electronic, searchable version of the Bible in Hebrew, Greek and Latin! There's the point: good use. Nuclear fission isn't bad, it's a tool we've learned to harness. It can be used to kill or prevent killing or heat the homes of millions. Someone once told me that money doesn't change you it just seems that way as it makes it easier for you to show who you really are. I think the internet and its sundry services is much the same. If you are a self-centered, shallow-minded narcissist then you'll waste your life away bouncing from link to link sharing them with friends appended with "lol". You'll likely be the same person who before the internet stood around gossiping over the water cooler every day about the 50 hours of TV you watched that week. Technology changes and that does have a feedback loop on impacting the culture that emerges from or submerges under it, but people are people and aren't ever going to be more or less than people. Our use of our tools reflects who we already are, it doesn't make us who we are. As tools are meant to do, they help us build. In the case of the tool "electronic information" what we're building is the point. Entertainment? Our 15 minutes of fame? An AI to rule us? A place to fulfill our pursuit of belonging? Freedom or tyranny? Wisdom and knowledge? 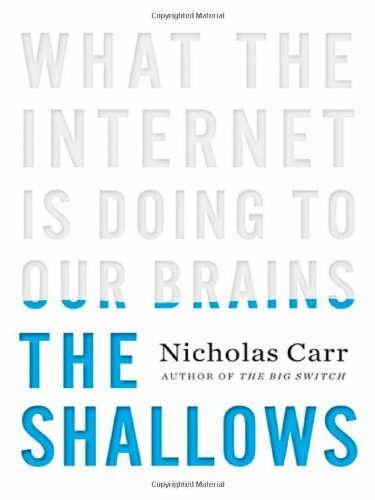 The Shallows points out that we should stop and examine this tool, the internet, and make sure we're making intelligent choices about its use for ourselves and our families. Hard for me to find any fault with that. I'm certainly going to re-examine how I'm harnessing technology as a tool and not vice-versa.